Gold Acrylic Mirror Sheet provides a luxurious, metallic finish. It has 10 times the impact strength of glass mirror ensuring it is safe to use in a wide variety of applications. It is also 50% lighter than glass so it is easier to handle and install. 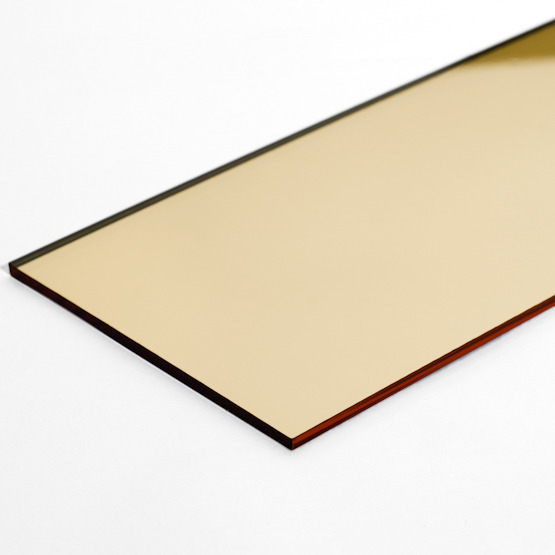 Gold Acrylic Mirror Sheet is highly cost-effective compared with glass mirror. It is also extremely resistant to weather making it equally suitable for outdoor or indoor use. It is commonly used to provide a unique, luxurious-looking finish for cosmetic displays, garden features and architectural applications. Gold Acrylic Mirror Sheet is 50% lighter than glass mirror so it is easier to handle and work with. Gold Acrylic Mirror Sheet is stronger than glass mirror and has ten times the impact strength. Its high resistance to weather makes Gold Acrylic Mirror Sheet equally suitable for outdoor or indoor use. To avoid distortion, Acrylic Mirror Sheet should always be applied to a flat surface. Where this is not possible, it should be attached to a flat piece of plywood of at least 19mm thick. For best results, the surface should be free of imperfections and a high-quality mirror glue or double-sided tape should be evenly applied.